Rev. 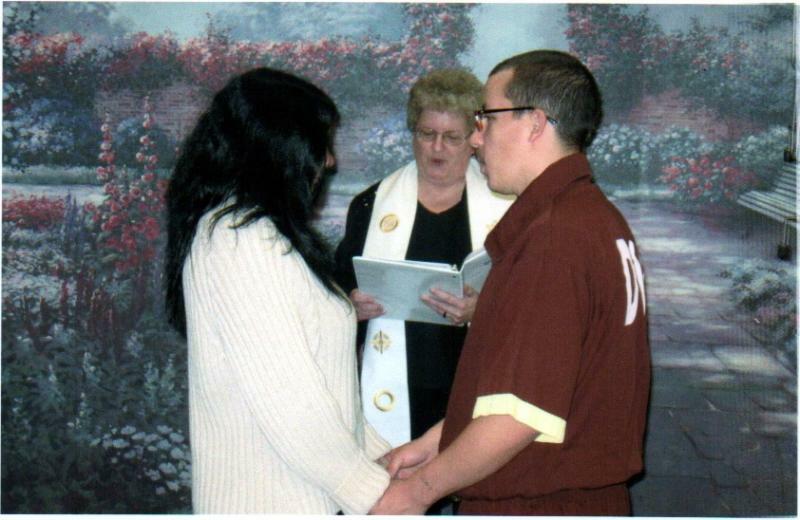 Debbie has been officiating prison weddings for six years. 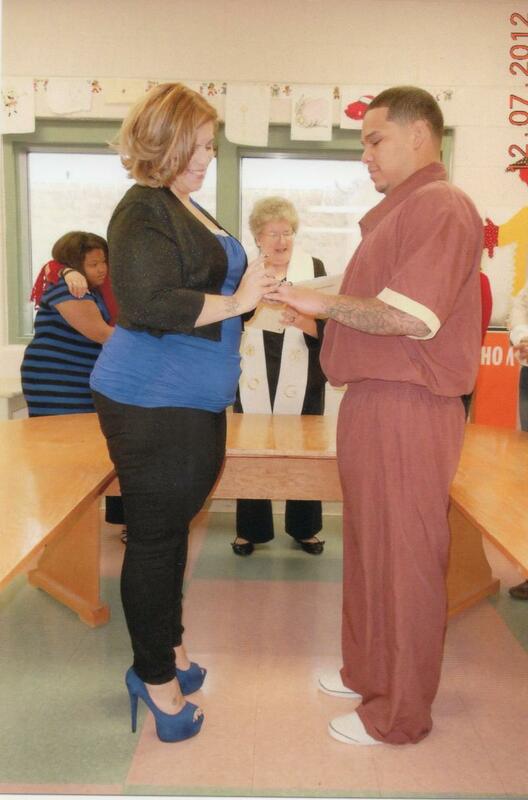 She can assist you with getting your prison wedding scheduled. Once it is scheduled, Rev. 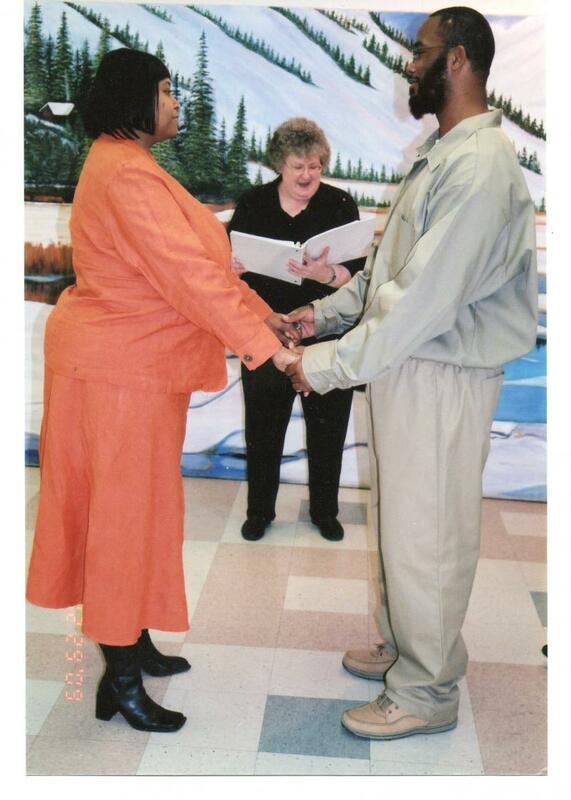 Debbie will create a unique and beautiful ceremony for you and your incarcerated loved one, travel to the prison and perform the ceremony, then sign and file the marriage license with the state (NJ, PA, DE). 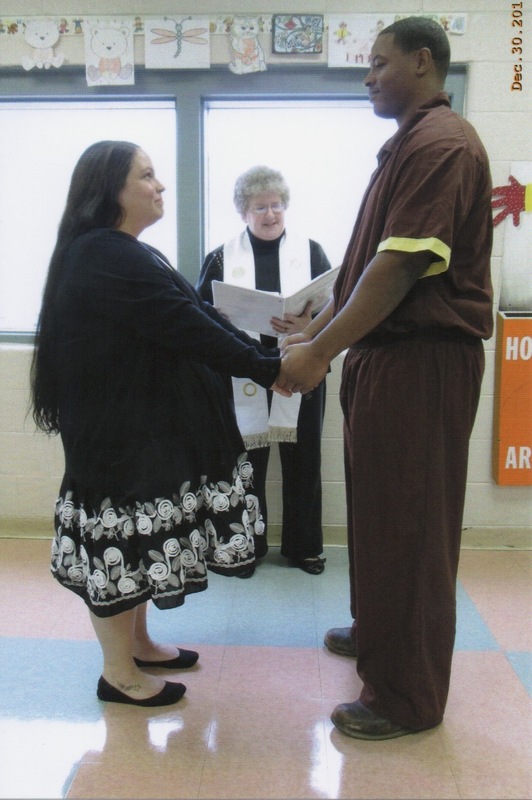 Read what our prison wedding couples are saying about our services! Our sincere thanks for performing our nuptials and making our day a blessed one. It was a pleasure meeting you. 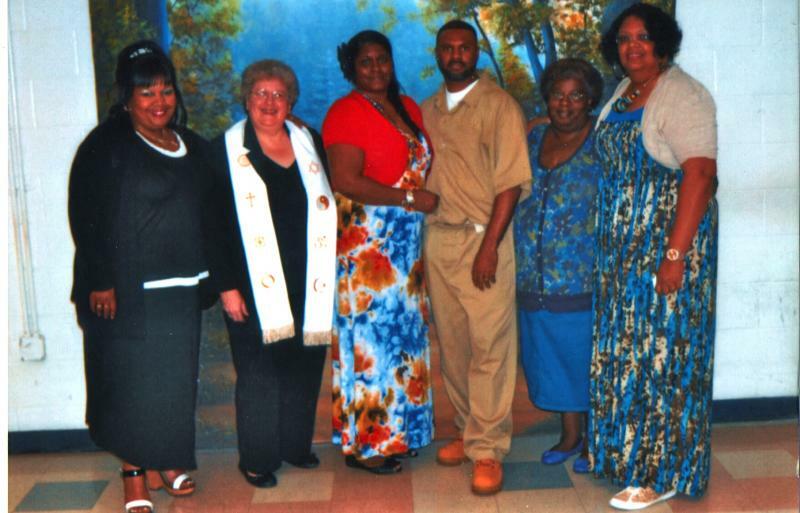 May God continue to use you to bring joy to others lives who are locked up but want to be united with their loved ones. Terell and I want to thank you for everything. You were there to help and guide us every step of the way. Thank you for being part of our special day. The ceremony was so amazing, so much more than I expected, given the circumstance. 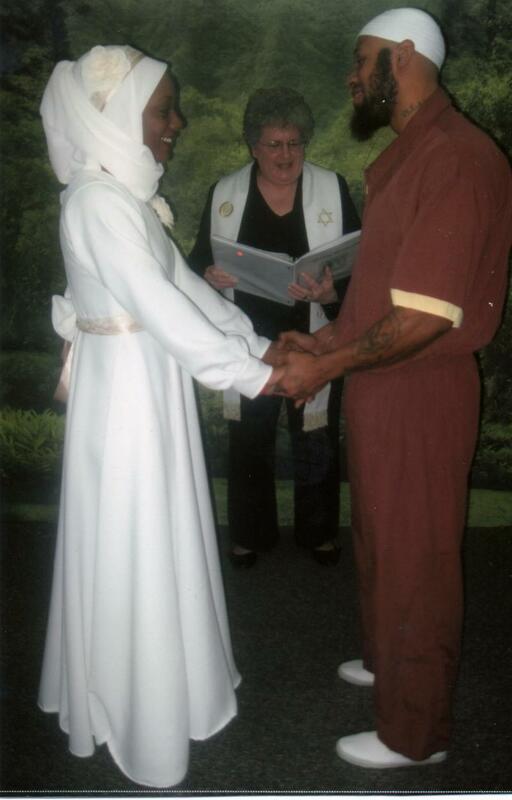 The vows you wrote for us were so beautiful and sincere they made me cry! So thank you again for everything!" "SO VERY HAPPY! Thank you so very, very much Rev. Debbie. 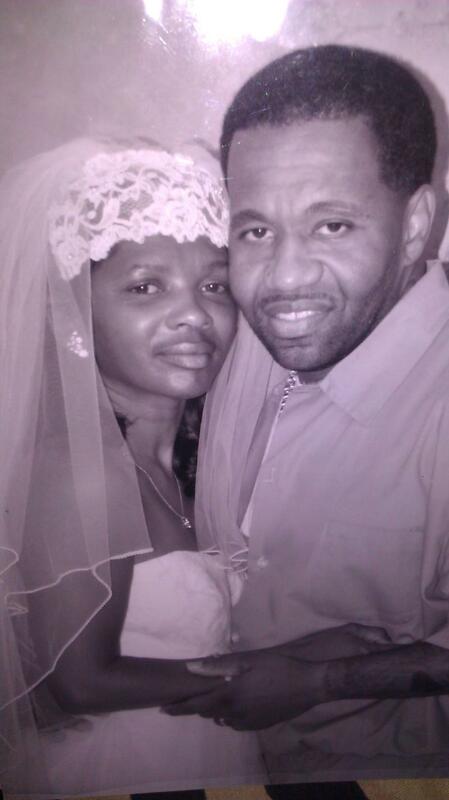 You made me and Rahsaan's wedding day so very special. You were a God send. Everything turned out fantastic! You really made our day! God bless you!" "Thank you for performing it [our wedding] for us." "Hello, Rev. Debbie...its Tiana. I just wanted to thank you again for everything yesterday. Thank you so much." "Thank you so much for making mine n Julio's ceremony so special"
"Thank you for doing the honors and marrying us. 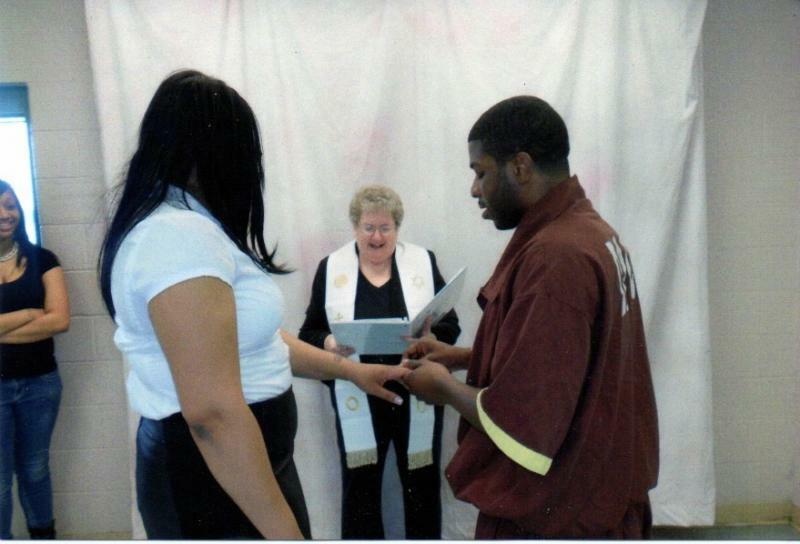 You did a great job and I love how you work.﻿"
Denita and I would like to thank you so much for your services, and for allowing me to surprise my beautiful, gorgeous wife with my song, which really surprised her and our witnesses. We really appreciate and enjoyed everything that you've done for us, and we wish you much success in your future endeavors. Thank you again, and may God continue to bless you, abundantly, exceedingly above all that you can ask, think, or imagine. I'll send you a picture as soon as they come back.﻿"
"Thank you. We appreciated you and your profound professional manner throughout! I'd rather pay for quality than pay and be disgusted!﻿"
"Rev. D, I just want to say thank you so much. You did a very good job. Or should I say wonderful job! Thank you once more .....﻿"
Kairi and I wanted to thank you very much for all that you did for us to make our day possible. If it weren't for you, him and I would have never gotten this far. Thank you very much for the package, too. We just wanted to say thank you once again. You were too busy today for us to tell you and my sister and I couldn't stay long. Thank You So Much!!!! !﻿"
"Hi Reverend, this is Rachel, the girl you married yesterday. I was just calling to say thank you and you did a good job. We really appreciate it! " 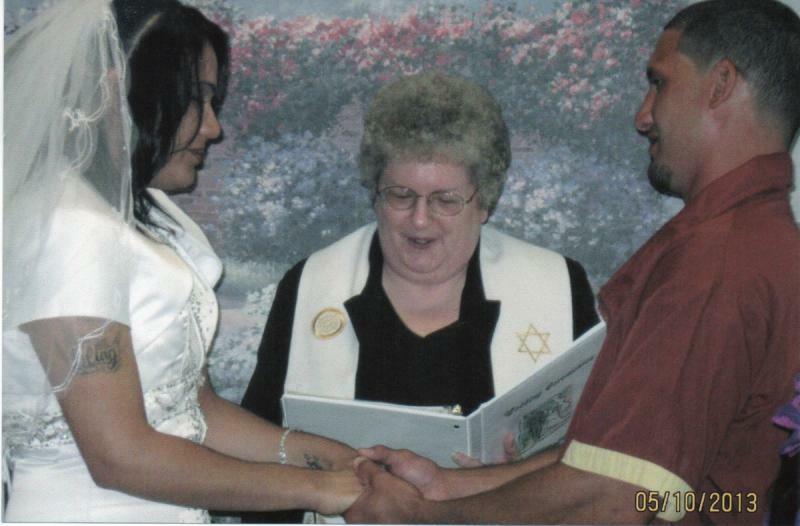 "Reverend Debbie is definitely the one to call to make your wedding day special. That's exactly what she did for us. She even took the time to personalize our vows to fit who we are as a couple. 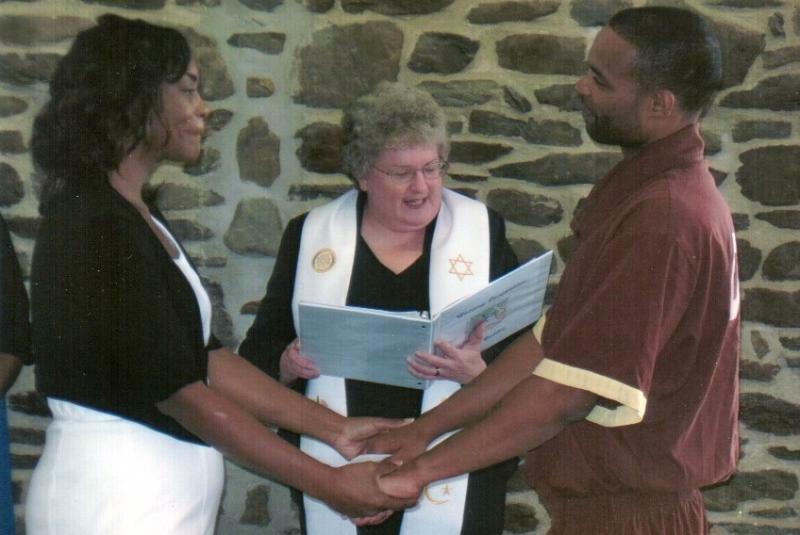 We were given a keepsake book that will allow us to hold on to our special day that was made perfect by Reverend Debbie. Weddings On Wheels is a unique service to fit all types of needs. 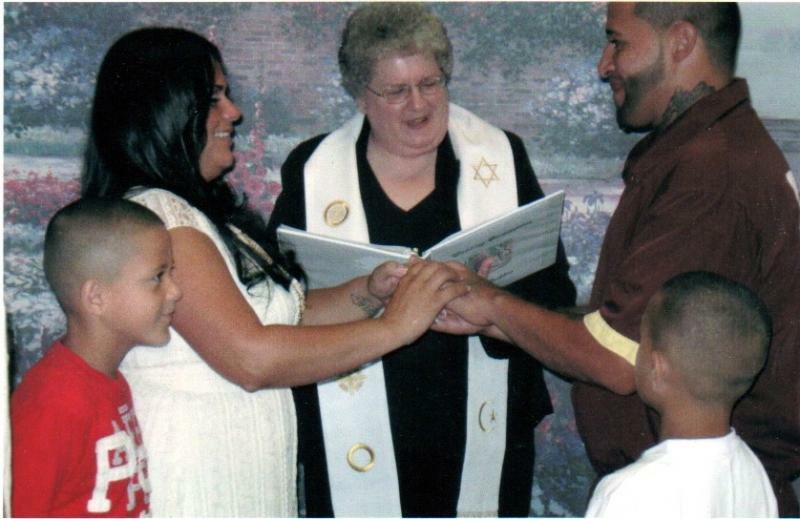 We had a unique wedding which was made as memorable and special as any other wedding." "My experience with Weddings On Wheels was wonderful!!! 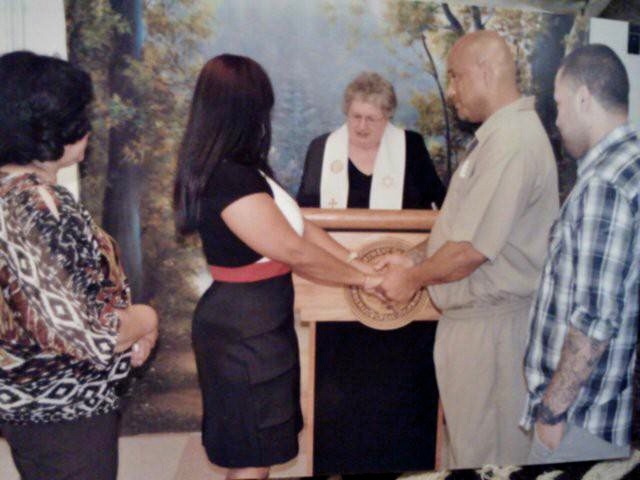 Minister Debbie really went the extra mile to make sure my husband and I were happy and satisfied. She even made some phone calls to help us out. The ceremony was beautiful thanks to her. My husband and I have already recommended her to a few friends. 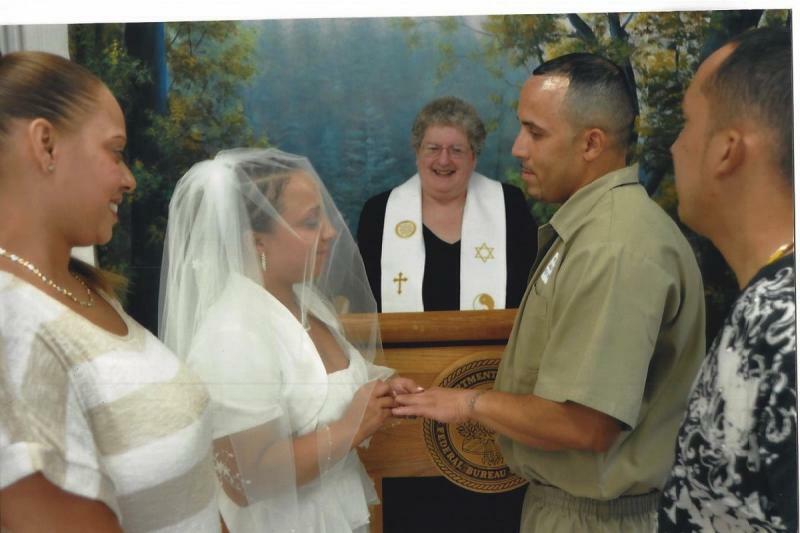 Planning a wedding can become stressful but I guarantee if you call Weddings On Wheels you will have one less thing to worry about.﻿"
Click here to request an officiant for your prison wedding.